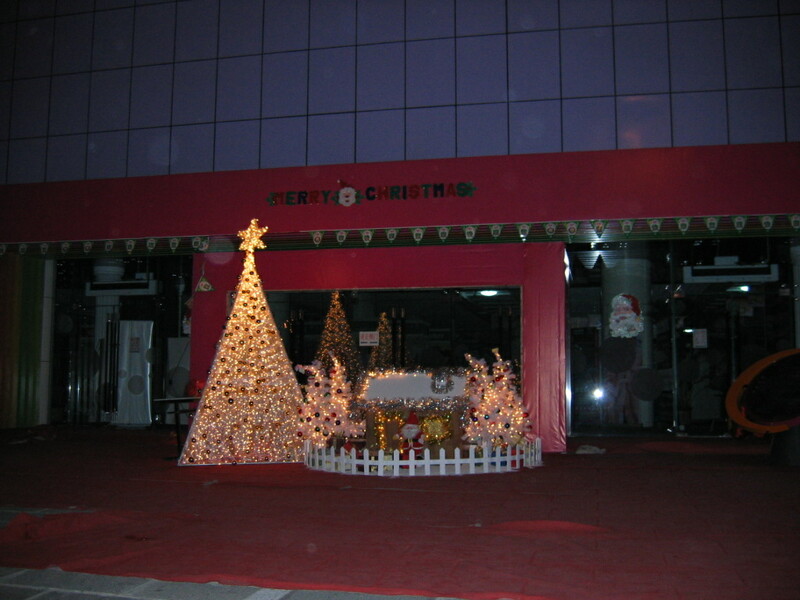 When I first moved to China (waaaaay back in 2005), there was certainly a fascination with Christmas but not really any widespread celebration. It’s an easily accessible aspect of foreign culture: happy songs, cookies, shiny gold decorations and a man in a red suit. I remember seeing the occasional Christmas display, an odd tree here and there, but mostly the “holiday season” was marked by people constantly asking me what I was doing to celebrate. My answer of, “Nothing, I’m Jewish,” was met with general confusion. 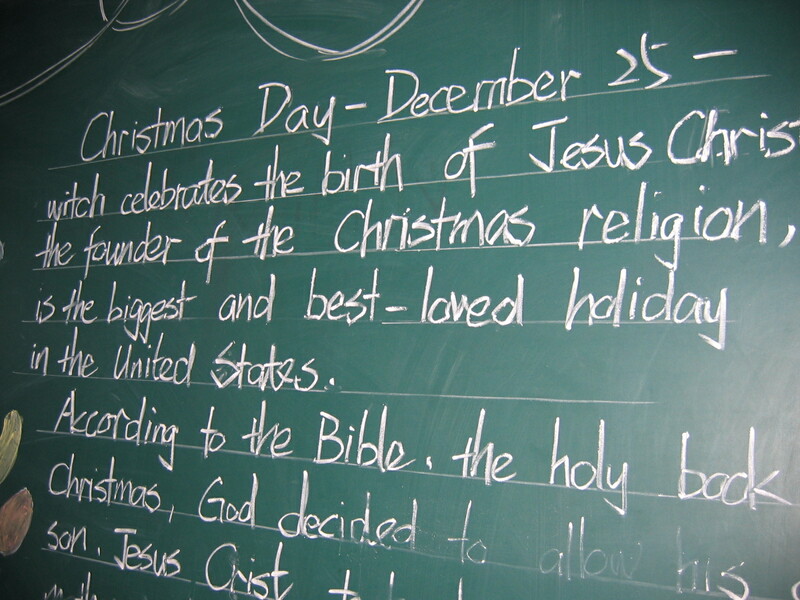 My students at the time were convinced that Christmas was an all-American holiday, as evidenced by their lovely classroom display. Now, there are Christmas events happening everywhere. I walked into Walmart on December 1st looking for a bargain humidifier and was immediately met with a huge display of fake Christmas trees and racks of decorations. My ears were bombarded with a constant loop of holiday music (I’m pretty sure they only had 3 or 4 songs on repeat) in a combination of Chinese and English. I suppose the shock and awe campaign did its job, because I ended up buying a few little decorations for my roommate. I also had “We Wish You a Merry Christmas” stuck in my head all night. Damn inception. Yesterday, I decided to go to a charity bazaar at the Beijing Hilton so I could poke around for a few little gifts for my buddies. I also planned to meet up with my friend Marie for a bit of gabbing and shopping. You know, a relaxing Saturday afternoon. 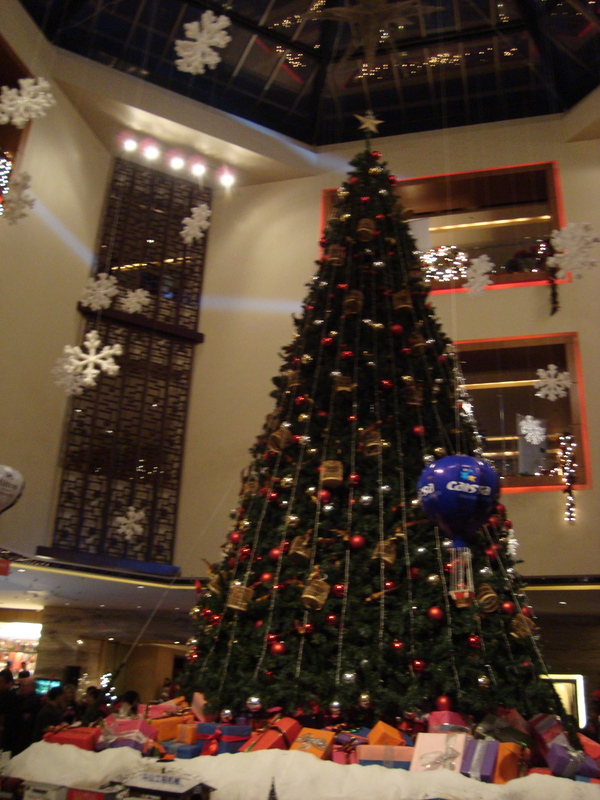 Little did I know that the hotel was planning a massive tree-lighting ceremony in the lobby, complete with girls in little red dresses passing out cookies and all the free Glühwein you could handle. For me that turned out to be about 1 glass, because it was mulled with cheap Chinese wine that made my stomach turn (the cookies, however, were delicious). It was definitely a very different scene from what I saw 6 years ago, especially the cleverly sponsored toy train running loops around their massive tree. Of course, even with a sparkling new tree, you can’t take the China out of Christmas. After they turned off all the lobby lights, but before they lit the tree, the hostess insisted on inviting people up to give speeches. First she gave a speech. Then the general manager gave a speech. Then some Chinese bureau chief gave a speech. Then some orphans gave a speech. Or maybe she gave a speech while the orphans stood there, I honestly couldn’t tell you because started tuning out mid-way through the GM’s babble. Meanwhile, you have dozens of parents with their kids waiting around in a dark room that had long since run out of cookies. It didn’t help that said kids were crammed full of those cookies and the sugary energy that naturally follows. Luckily, after 45 minutes of nonsense, they finally got down to the important stuff. No, not the tree lighting. Santa. After untangling his beard from the rope, the diminutive Santa stand-in was briskly escorted through the crowd by a bunch of bodyguards clearing the path as if he were the president. I think he was giving out candy to children, but it was hard to tell as he went by in such a blur. 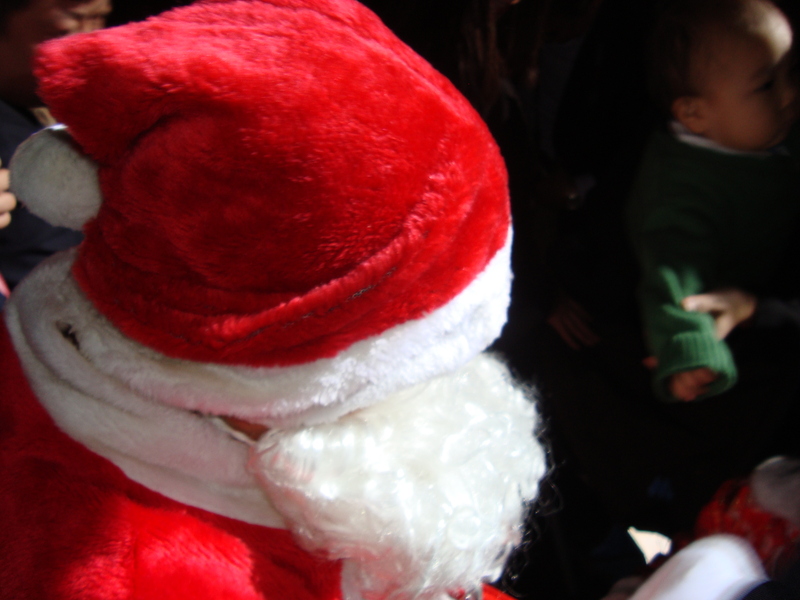 I suspect there were also some children jostled out of the way by the surly men in suits, who seemed more intent on just completing their lobby lap with Santa than delivering a fun experience for the people who showed up to see him. 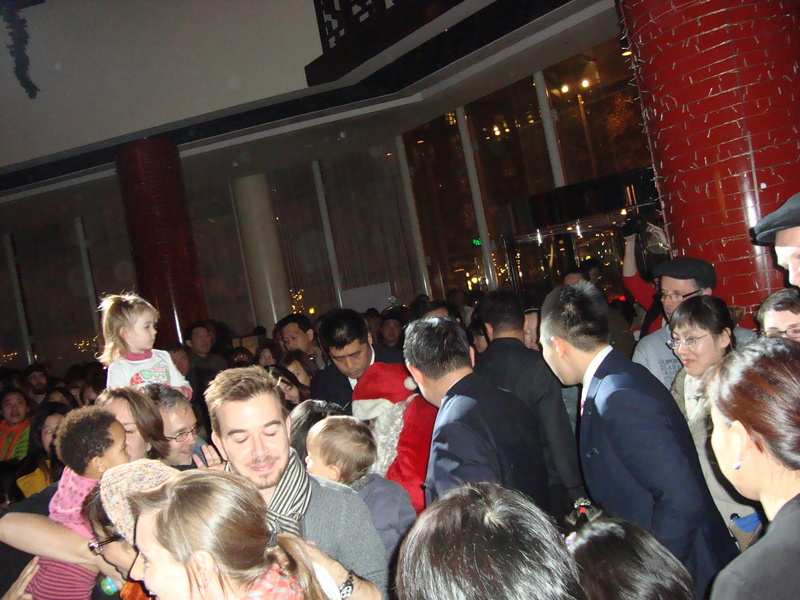 My advice for celebrating Christmas in Beijing? Wear protective gear and bring your own booze. Then, let the merriment begin!